It has been a long time since I have blogged, but my to-do list has been so long! No more excuses! It is the beginning of the school year and time for some inspiration! In this time of instant gratification, online gaming, less family face-time, and less communication, we need to inspire our students by giving them something to go home and talk to their families about. It is time to make learning memorable! You can't be "Super Teacher" every day of your career, but if you aren't causing students to go home thinking their day was amazing, we aren't inspiring their creativity. Last school year I wanted to make our Space unit more memorable and make a real difference in our school. I really wanted to take my students to a Planetarium for a field trip, but we were maxed out on the number of trips we could take. I ran across an idea on Pinterest for a cardboard planetarium from Beals Science. Using their amazing plans, I wrote a Donors Choose for some of the supplies, which was funded pretty quickly. I contacted a cardboard company that is right around the corner from our school. They were the nicest people and they donated all of the cardboard (plus lots of extra)! 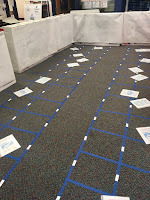 I made templates with my kids, then let them measure and trace the templates on the huge cardboard. For safety reasons I cut the cardboard all by myself and scored the flaps. I drilled holes where the rivets were supposed to go. We started attaching the panels together in the classroom, but quickly had to move to the media center to complete the hexagons and pentagons. On day 1 of building, I quickly realized that the rivets were not going to hold the very thick cardboard. I had to run to the hardware store after school and get zip ties to try on day 2. Zip ties worked and with a lot of effort from the kids and multiple staff members (thanks to everyone at my school that helped!) we were able to put it all together! The cardboard was the extremely thick and durable kind, so it was very heavy. Also, third graders are not perfect when it comes to tracing and I was not perfect when it came to cutting, so I needed to do some reinforcing inside. I went back to the hardware store and bought pvc pipe and 3 way connectors to make a cube inside the dome before I allowed students inside. Once it was built, we viewed some planet videos inside so we could see the dome in action! It was amazing! We also shared it with the other grade levels in our building as space is covered in First grade, Third Grade, and Fourth Grade. A few other grade levels visited too! My students remember this activity fondly because they learned about geometry and the importance of precision in measuring, tracing, and cutting. They also learned about perseverance when it came to building this huge dome and how even the best laid plans have to be revised to complete a project. They also successfully learned about space and the planets in an innovative way. As kids walked into my classroom on the first day of school this year, I overheard several of them mentioning that I was the teacher that built the planetarium and completed some other cool school-wide projects last year. 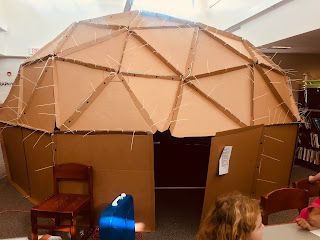 This school year I am already making plans to build a reusable dome out of PVC pipes and connectors! I already have the connectors funded through a Donors Choose and I am asking local pipe manufacturers to donate the pipes for us. We finally were able to complete a Breakout EDU that I got from the Sandbox a couple of weeks ago on the Solar System called Lost in Space. Students had to work in small groups to compile information on the planets, their sizes, locations and famous astronomers. They solved problems and used clues to determine how to "break in" to their box. All of my classes were successful in completing these activities. 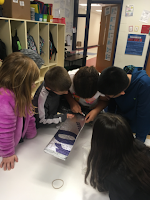 This week students walked into my room to a Breakout EDU game of my own creation! We have been studying Historical Perspective and how the history of our community shaped what our city has become. I took historical events such as the first Gold Rush in US History, the Mecklenburg Declaration of Independence, the Charlotte Mint, the Cabarrus Black Boys group who fought the British in their own way, and other regional events. I developed clues using Primary and Secondary Sources from these events, creating short passages and artifacts for students to read. Using these clues, students identified the codes for each lock. Once they unlocked all of the locks, they discovered artifacts such as cotton, corn meal, and gold "nuggets" that I got from Hobby Lobby. Talk about engagement! My students loved every minute of it and were working extremely hard the entire time! They even said that is was more fun than a PBL! I believe that is just because it is something "different," but the kids enjoy it anyway. I cannot wait to do this again! The field of education is slowly becoming mechanical. Teachers are expected to complete more paperwork and prove that their students understand the concept using a variety of data points. School days are micromanaged to the minute of what students are expected to be doing, where they go, and how they complete certain activities. With our endless checklists and constant hustle to get from one activity to the next, we often forget to engage students to the point where we make learning memorable. What are your students going to remember about your class next year? What will they remember when they their 30s? Our students deserve to have fond memories of their elementary years. It is our duty to create safe places for our students to learn in a more memorable way. Open your mind and think outside of the box. What Problem Based Learning (PBL) ideas can you use? Can you base your entire unit around one concept or idea? This year in my third grade class we based our entire Forces and Motion, Heat Transfer, and Matter units on real-life events. Through teaching in this manner I noticed that my students more engaged than with our normal science experiments and PBLs. During these units we used the World Series to study forces at work in baseball. We connected with what students were learning about in reading by experimenting with the Titanic. We then completed a school-wide PBL on the Miracle on the Hudson, with each grade level connecting this event to their standards. 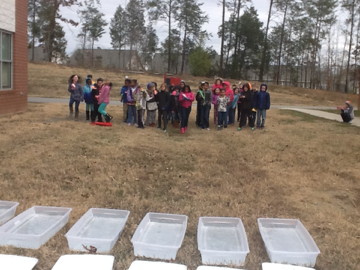 Every grade level visited Carolinas Aviation Museum in Charlotte to view the actual Miracle on the Hudson airplane. The museum staff adapted their centers to tie into each grade level’s PBL. We brought in a passenger from the Miracle on the Hudson to speak to the students about her experience on this flight. The next day students arrived to see our classroom transformed into an airplane. I portrayed a flight attendant, checking tickets for every student that boarded Flight 1549. The tickets were created with real passenger names and seats. We watched the safety video, then followed the audio from the cockpit as the plane descended into the Hudson River. 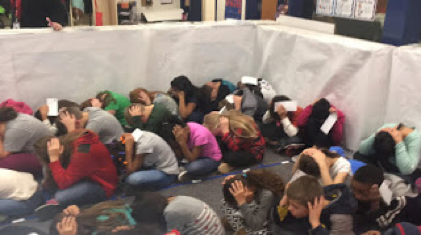 Students had to brace for impact and escape once the plane crash landed. We had a discussion about the science behind the crash, then wrote stories from the point of view of the passengers on board. We designed and weighed down paper airplanes with paperclips, then performed water landings using these airplanes. We then paired with fifth grade and researched aviation throughout history. 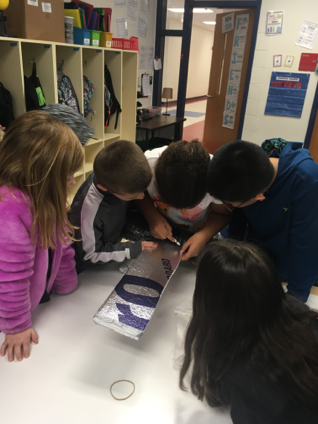 Each class built a large model airplane of their assigned era. Classes were split into six groups. Five of these groups built one part of the airplane. Group six was responsible for identifying problems during the building process and for putting the entire plane together. Each group had to perfect their communication skills to make sure their airplane was symmetrical, that the sections fit together and that each piece was proportional. As a culminating activity, our school partnered with Carolinas Aviation Museum for a Night at the Museum with stations set up for each grade level to showcase their products. All of our families were able to attend for free. The whole school PBL idea involved all of our students and made learning the curriculum memorable. These types of lessons and events are what make school more engaging and unforgettable. I want to challenge you to make your teaching memorable. Find more ways to bring excitement into your day. 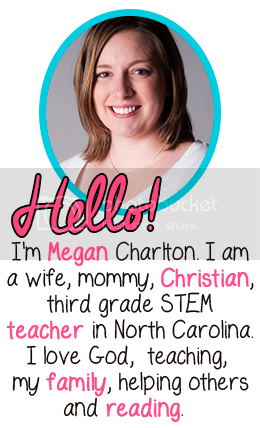 *This post was first shared by Megan Charlton on ncaee.blogspot.com on January 22, 2017. Last summer several STEM teachers from our county participated in a program we call STEMersion. Through this program we were able to go to local businesses and learn about STEM careers. During this process, we visited Carolinas Aviation Museum and saw the Miracle on the Hudson airplane. We were inspired to create a whole-school PBL where each grade level connects the Miracle on the Hudson to their curriculum. We are all visiting the museum in January for a field trip. In third grade we are using this event to recap our knowledge on Forces and Motion, Matter, and Heat Transfer. We started off this week with a special guest, Beth McHugh. She was a passenger on the plane. She explained her story to the kids and they were able to ask her questions. I took notes on their questions and have spent the last few evenings gathering material on Canvas for them to do more research to find additional answers for their questions. The kids are obsessed! The next day students arrived to see our classroom transformed into an airplane. My loving husband even volunteered to play the captain. Ms. McHugh even dropped it to watch!I portrayed a flight attendant, checking tickets for every student that boarded Flight 1549. The tickets were created with real passenger names and seats. Each student checked their luggage into their cubby, found their seat on the airplane, and prepared for take-off. Students could peruse safety pamphlets while they waited. After the students boarded the airplane, they viewed a safety video, then watched a demo version of the crash with audio from the cockpit and air traffic control. I voiced over the video with audio of me chanting, "Brace! Brace! Brace! Heads down, stay down!" 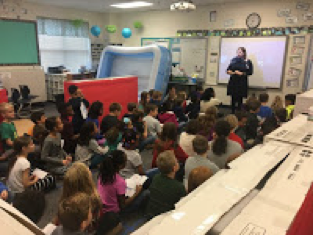 When the crash occurred on video, I paused the video so students could "escape" out of the airplane onto cardboard wings and blow-up pool life-rafts. We stopped and talked about what it was like in the raft and what it was like on the wings. We talked about how cold it was out there while they were waiting to be rescued. Some people jumped or fell into the river. This caused their heat to transfer into the water, causing hypothermia. Several students made the connection to the Titanic Tragedy, which we also studied a few weeks ago (Score!). On Wednesday, we practiced making a variety of paper airplanes. Thursday we will be picking our favorite paper airplanes, folding them, then weighing them down with paperclips while we discuss balanced forces and the other forces required for a plane to fly. The goal is to make an airplane travel 20 feet and land properly on a target without performing tricks. Friday we get to use under bed storage bins to make our paper airplanes perform a water landing! More pics to come later on! Now that I teach STEM three times a day, every day, I can delve into our curriculum documents a whole lot more. This year I realized that we have not been teaching water forms in the way we needed to teach them. Of course we were talking about rivers, lakes, streams, oceans, etc. What I discovered was that we were not talking about the types of water found in these locations. I'm talking fresh water, salt water, and brackish water. How in the world can I share this information with the kids in a PBL? A colleague of mine started brainstorming with me about how we have all of these types of water systems in North Carolina, so we could make it relevant for the kids. -Determine if the animal will survive in the given habitat. If it will not survive, where does it need to be placed? -Find at least 5 facts about your animal. -Locate a place in North Carolina where that animal would be able to survive. -Create a 3D model of the water habitat and your animal using box (make a diorama). Students went to town on this project! We repurposed some boxes from the Chromebook boxes we had just received and I gave students construction paper, markers and glue. At the end of their hour, I asked the students about they type of ecosystem it required to live. If students answered correctly, I gave them a printed picture of their animal, which they glued into their diorama. If they were incorrect, we had to hurry to adapt the ecosystem to be the type they needed. on the paper I provided them. Then, we hung their beautiful artwork in the hallway for all to see! The third graders loved this activity and learned a lot about how waterforms affect the wildlife and how all of the waterforms are connected. How do you teach about land and water formations? In mid September I did a stupid thing. I removed most of the chairs in my classroom and replaced them with yoga balls. All 24 seats worth of squeaky, bouncy, blue balls. I was so excited! I naively assumed that I was offering flexible seating to everyone. I was not. I was offering alternative seating, while giving them a chance to sit in a regular chair, if absolutely needed. Every time students got too close to each other or to the legs of the desk, this horrible squeaking sound pierced the air! I started to get sea sick when I was looking out at the class as they worked. Something had to be done! After having some candid discussions and doing more research on flexible seating arrangements, I changed my way of thinking. I decided to rearrange my classroom completely. I had all of these yoga balls, several wobble chairs, and balance pads that were not being used. I moved my u-shaped table to the middle of my classroom and returned the crate seats to their original location, around the table. Students now had a choice to sit on the crate seats. I made a small group of 5 wobble stools and a small group of 2 wobble stools. I created a table group of 4 chairs with balance pads on them. I created a group with regular chairs. I made a set of private islands so students could choose to sit by themselves. I also made two standing desks. These were made out of our regular desks and bed risers. I happened to have two tall stools students can use at these desks. My new rules are that you come in my classroom and make the best choice of a seat for you that day. There are 29 choices of seats to use (24 desks and 5 spots at the table). If you have sat at a certain spot once, move and let others have a chance to sit there. If nobody wants it, you are welcome to have it back. Once you choose a spot, you are there for the rest of the block. No seat hopping. If you make the choice to sit with your friends and talk, there is no warning or arguing. I will move you immediately. I teach STEM (Science and Social Studies) to three blocks of students each day. This means that I have 3 sets of up to 24 students that come in, choose a seat and get started with their block. So far, this arrangement has worked with every single class, every single time. I have had to move a few students here and there, but all in all, it is the best choice I have made for my kids. They choose where they feel like they need to sit that day and really don't take advantage of it. When we have group work, the students go sit around on the floor, choose an area to sit and work together, or stand together near the standing desks. It really doesn't phase them. In the future, I would love to add some bean bag seats and other seating options away from desks. What can you do to create alternative seating? Find different ways to create more choices of stools, seats, and locations than you have students. Let them have free choice of where to sit and what to sit on. Empower them! Here I sit at Embassy Suites in Concord, NC after a fabulous first day at our conference! I have a great view from my hotel room, a fabulous roommate, and great friends to learn from! I was able to help meet and greet people, passing out nametags and some awesome swag! I felt very important wearing my nametag with all of my new titles on it! I even got to present this afternoon! My session was called "To Infinity and Beyond! How to incorporate STEM into all subject areas. We tried to focus on creating Cross-Curricular PBLs with what we are studying at the time in other subject areas. It is just so hard to try to explain everything that goes into making your PBLs Cross-Curricular when you don't know what people are working on at any given time period. Long story short - look at your curriculum plan and what you will be teaching about in each subject area on a given week. See what you can do to combine all of those topics together. For my fabulous friends who attended my session, thank you! I hope you got something out of our meeting today. Here is my Presentation and my Planning Sheet. Let me know if you have any questions or if I can help you out! 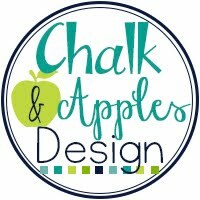 Blog design by Chalk & Apples. Some fonts by Brittney Murphy Design.